made the composite to illustrate a friend the size of the umbra. Hope you like it. Hi aramgrg, try uploading the image directly to Asterisk now. The link you used doesn't seem to be working. Ooops, image link is broken. Here is the image. Around the world in 80 panes! Thats the explanation to this image. It is an 80 pane mosaic taken 6 months apart , 44 panes were taken in March this year when on a trip to New Zealands South Island at Hoopers Inlet on the Otago peninsula. And the other 36 panes were taken in September 2017 at Lands End , Cornwall UK . 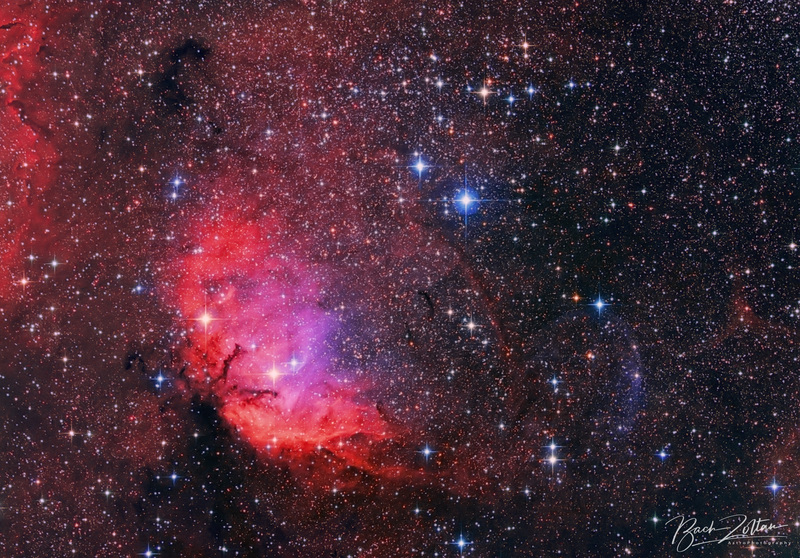 The Tulip Nebula Stewart Sharpless was added to his catalog in 1959 with Sh2-101. 70 light diameter and approx. It is 8,000 light years away from us in one of the foggy and star-rich regions of the Milky Way. The strong ultraviolet radiation from the nearby HDE 227 018 hot-star star ionizes the atoms that make up the nearby Tulip haze, which makes it radiate. In addition to the visual experience of the picture, it is the bluish arc on the right side of the photo. This arc of ionized gas is a shock wave, which we know is a black hole (Cygnus X-1) from which we can see a material congestion of a relativist jet that breaks out due to material transfer in visual form. While black holes cannot be seen, the effects on their surroundings are still indirectly revealed. Last edited by bystander on Mon Jan 28, 2019 5:05 am, edited 1 time in total. Blood Wolf Super Moon - moment of meteoroid impact: Canadian Daniel Pasternak an amateur photographer videos first ever lunar impact during an eclipse. There have not been many Sun Spots in the past year? and AR2733 is one of the largest active regions in over a year. The Cigar Galaxy in HaLRGB. in the picture is: Two Earth Shadows. Earth's shadow in the atmosphere. Earth shadow on the moon. Above the Earth's shadow is the Belt of Venus. Processing Information: Panorama from 32 shots. 2x BKT, ISO 100, f / 8, 1/25 and 1/6 s.
bicolor image Ha and O3 - 24 h exposure, older data reprocessed. 5 hours with AS20 of Chilescope. Last edited by bystander on Sun Feb 03, 2019 4:37 pm, edited 1 time in total.